Pork Buns anyone? Momofuku Pork Buns!? The tasty snack has been giving New Yorkers happiness and delight for quite some time now, but the French, that's a different story. Most of the guys here have never heard of, much less seen or tasted a pork bun. However, Chef Michel and Chef Florent Boivin here at La Maison Troisgros have experienced them at Momofuku, and they loved them. As my stage at La Maison Troisgros has progressed I've slowly been getting more and more freedom in the kitchen. So I decided to push the limit a bit and ask if I could create something totally different from the norm, a Momofuku Pork Bun! The kitchen here works at an insane pace. The maximum we've served during my stage is 64 people at one seating. Don't kid yourself, that is very difficult. The kitchen of 14 people is putting out around 500 plates on a night of that magnitude. What this means is that I'm the only one with the time to create the famous Momofuku buns. But steamed buns, sounds a bit difficult. I knew if there was ever a place for me to try it, La Maison Troisgros was it. Here I go. Being a French gastronomical kitchen we have many wild ingredients and tools, but not all things, certainly not Asian things. Some adjustments to the recipe were necessary. Dehydrated milk, bread flour, active dry yeast, Hoisin sauce, and Sriracha don't exist in this kitchen. I was a bit worried, but Florent quickly solved these problems with substitutes of buttermilk, regular baking flour, live yeast, and ranch sauce. Not long ago the kitchen staff was introduced to Ranch sauce, now they devour the stuff. Ranch seemed like a perfect substitution...who knows if David Chang would approve? I'm no baker. I revel in baked goods, and in fact the Patiserrie may be my favorite thing here in France, but baking is not my strong point. Even though I was working with Florent to make the dough, in my mind I was worried this may be a failure. Preparing food for guys who literally create some of the most sought after food in the world, is a pretty nerve-wracking task! Within a matter of 30 minutes the dough was rolled out into individual circles on parchment paper, folded, and placed in a warming closet. I couldn't help but wonder; is it this type of gadget (warming closet) that makes the difference between homemade baked goods and professional baked goods? Here the temperature and humidity are controlled. At home I just set the dough on the counter to rise at whatever given temperature and humidity my house is at. What truly makes the difference? Ranch sauce. 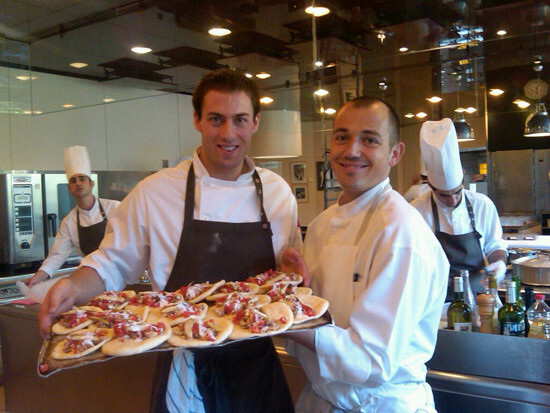 Chef Michel Troisgros' son Cesar worked for a year and a half as a chef de partie at the infamous French Laundry. While in Napa Valley he learned to make an incredible Ranch sauce, along with many other things I'm sure. A few weeks earlier he taught me the recipe. Hidden Valley would go out of business if this stuff were put on store shelves. Plus, it's so simple you can do it at home...yogurt, lemon juice, green onion, cumin, coriander, salt and pepper. Now you're in the condiment business. The French are masters at preservation and at La Maison Troisgros we preserve everything, from mushrooms, to eggplant, zuchinni, onions, lemons, apricots, plums, capers and more. We used cornichons (small cucumbers or gherkins) that have been pickling for five months. Our only other topping was some finely diced cherry tomatoes. After letting the buns rest for 45 minutes I baked them for 12 minutes at 90 degrees Celcius in a steam oven. Voila, these babies were hot, moist, and ready for the savory pork belly and the tangy, sweet, and crunchy bite the condiments gave. Unfortunately I was finishing right as the service began. I was like a puppy who lost his only toy. Desperately I wanted everyone to chow down. I yearned to see smiles of glee and affection as Ranch dripped down their cheeks. My ears searched, but to no avail, for the power-packed crunch of the cornichons snapping in their mouths as they delighted in my creation. Temporarily I was out of luck. However, like a salivating dog, the mouths of the cooks could not stay away from the pork buns. Before long the tray was empty as they'd sneak upstairs and chow down. Success! After some nervousness, temporary fear of failure, and a little help from Florent with the dough, the pork buns turned out great. I'm pretty sure David Chang would be proud knowing that a three stars Michelin restaurant is totally digging his creation. I doubt the pork buns will be making the menu here anytime soon but if any of you know the mastermind behind this dish, you must let him know the French have a new delight. Olympic gold medalist Garrett Weber-Gale is the co-founder of AthleticFoodie. He plans to use the skills he learns in the world's best kitchens to help others enjoy great-tasting food that is healthy.